It is axiomatic that private sector productivity drives the economy and that public sector spending relies on the private sector to generate wealth for the economy as a whole. Government borrowing is, of course, nothing more than an advance taken on private sector wealth to be generated at some future point. Given this simple fact of life, you might think that a government interested in promoting economic development overseas would channel taxpayers’ money to private sector initiatives, but if you look at the twenty top organisations through which UK aid is channelled, hardly a bean seems specifically directed at private sector recipients. In 2013 less than ONE per cent of UK aid, or Overseas Development Assistance (ODA) in the jargon, was paid out to private sector projects via CDC Capital Partners, a venture capital organisation with a distinctly chequered history. By scratching around elsewhere in the statistics, one can glean that 3.5 per cent of UK bilateral aid was directed to “Production Sectors”, though since this money will have been disbursed on a government to government basis, there is no telling how much actually ended up with the productive sectors in the recipient states. That’s not to say that this smidgen was dissipated in a welter of corruption. There are plenty of commentators who argue that the richest individuals in developing countries are generally the people responsible for awarding aid-funded contracts and where they are not, they have been relegated into second place by the anti-corruption commissioners. So without going that far, it is a certainty that UK aid fails to promote the kind of economic stimulus which might help beneficiary nations on the same development path taken by those countries that have successfully industrialised since World War II. Aid, as a means of promoting development is a busted flush. Since The Gold Coast became Ghana as the first British colony in Africa to gain independence in 1957, almost sixty years have elapsed and yet that country currently still stands in 20th position (with a stonking £500 million in 2013) in the table of aid recipients from all the major donors. After over half a century of hand-outs, Ghana still consumes significant international benevolence and nobody seems to find it obscene to divert funds from north to south that bring advantages to neither side and which demean the people of Ghana. 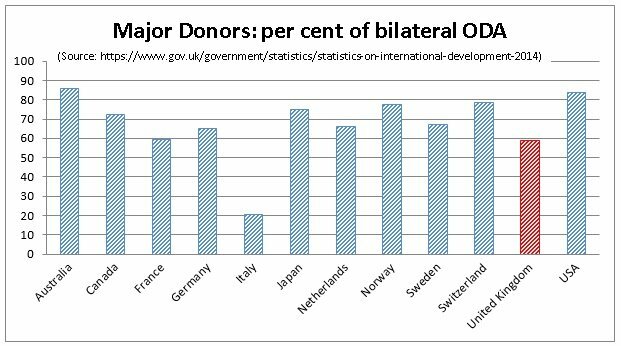 That notwithstanding, the UK is now the second largest donor after the US as the graphic below shows. She spent more on aid than the combined totals of Austria, Belgium, Denmark, Finland, Korea, Spain and ten other developed nations put together. The club of rich countries that make up the Development Assistance Committee of the OECD agreed in more optimistic times that they should each aim to devote 0.7 percent of gross national income to overseas aid and while lip-service has continued to be paid to this target down the decades, only Norway and Sweden have attained this target and that possibly for reasons that are touched on below. 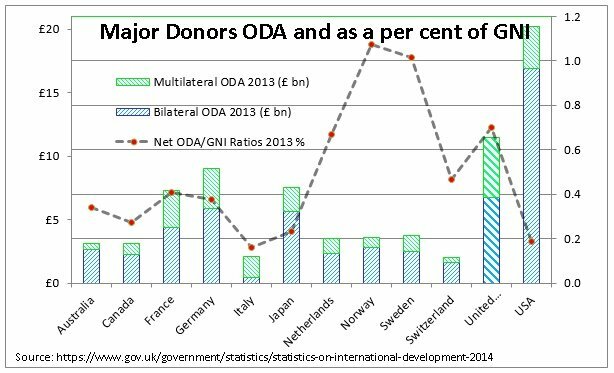 This explains why the UK contribution is so high since David Cameron decided to meet this arbitrary target and the following graphic shows just how out of kilter the UK is with the rest of the donor community. Countries that meet or come close to meeting the 0.7 per cent target have much smaller economies while the US which pays out more has a much larger one and contributes less than 0.2 per cent. Those countries that come after the UK in money terms fall well behind in terms of the share of national income which they give in aid. The UK taxpayer could feel a sense of satisfaction if there was some demonstrable gain to the recipients of this largesse but there isn’t. Cynics might observe at this juncture that development is not necessarily the sole objective of overseas aid. Bilateral aid has often been used by donor countries as an adjunct to foreign policy or as a boost to exports. For example, when the developing and ‘non-aligned’ world sided with Argentina and against the UK in the wake of the Falklands invasion, Sri Lanka was an exception and was rewarded in due course by a UK funded dam project built by UK contractors. In this way, multilateral aid channelled through agencies like the World Bank or the EU is “purer” than bilateral aid which may be tied to goods and services supplied from the donor country. Alternatively, contributions might be contingent upon the warmth of relations between donor and recipient more than any ostensible merit or need as compared to other countries similarly circumstanced. It follows, therefore, that donors that disburse more money through bilateral channels enjoy greater political or commercial advantage from their giving. The picture for the UK here is hardly encouraging. 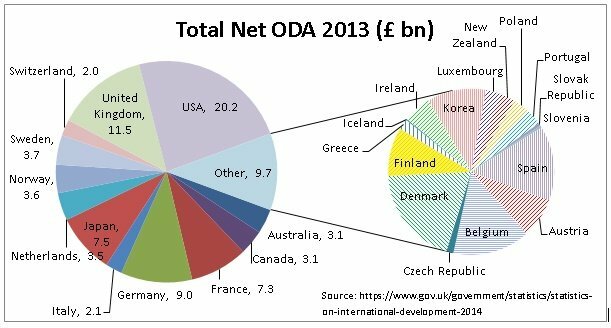 Only Italy spends a lower proportion of its aid bilaterally and this may be due to its treaty obligations to the EU, various historical reasons as well as to save on an expensive administration like the UK’s DfID to look after a relatively lowly total. All in all, the score card is not encouraging. Beneficiaries don’t benefit, UK exports don’t get much of a boost and the political leverage is scant. Rather than continue to fork out for aid that has astonishingly been exempted from a trimming while the defence budget is to be further reduced by an additional £500M, perhaps we should scrap the whole thing? 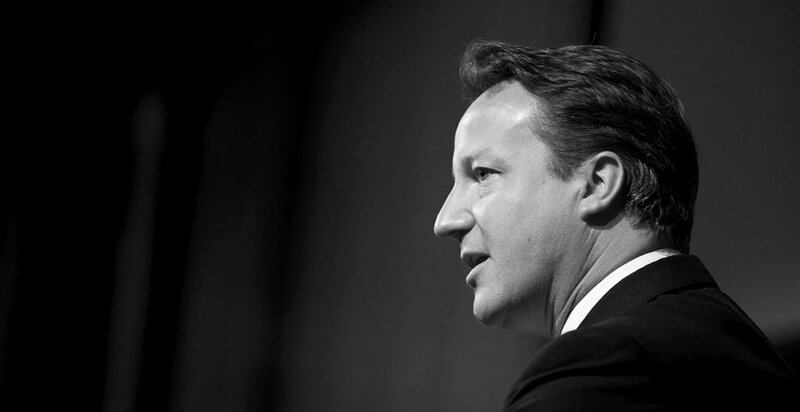 How can David Cameron justify close to £12 Bn without discernible gain and to meet a decades-old target that other countries now almost entirely ignore? However, helping the development of countries with which this country has long-standing and historical ties is a worthwhile objective so perhaps the UK should rethink its policy so that what is known to work universally, namely that the private sector has the exclusive role of creating prosperity, be applied to the business of overseas development assistance. What is needed is free access to the UK market for exports from the developing world coupled with funding for overseas companies in both local currency and foreign exchange, ring-fenced from interference (in the broadest possible sense) by local officials or hostile regulation. There will be business failures, naturally, but that is a fact of life for any organisation that is priming the pump with venture capital but those business which succeed and grow will bring prosperity to their communities and the taxes which can reasonably be levied will promote public sector activity as well. The challenge which the UK should face up to is that a country like Ghana will not, in 2057, a hundred years post independence, hold out the shameful begging bowl forced into its hand by decades of well-intentioned but wholly misguided policies that reinforce welfare dependence.